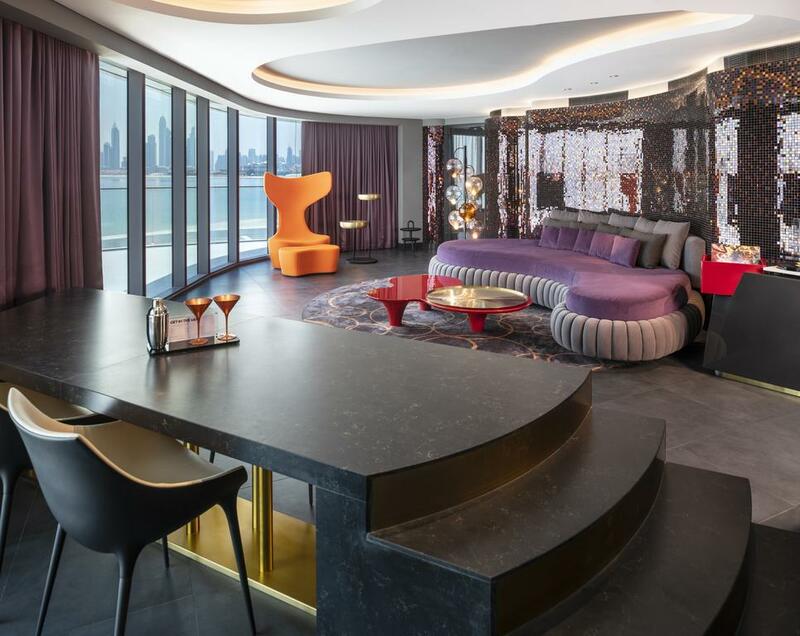 W Hotels Worldwide, part of Marriott International Inc., announced the opening of W Dubai – The Palm, located on the Palm Jumeirah, the largest man-made island in the world and one of Dubai’s most iconic attractions. W Dubai – The Palm is the newest W Escape, the W brand’s playful spin on the traditional resort experience and is set to add a new beat to the already dynamic and pulsating city. With its electrifying style, evocative design and eclectic destination restaurants led by world-class chefs including Massimo Bottura and Akira Back, W Dubai – The Palm will shine bright in the famed City of Gold. The breathtaking design of W Dubai – The Palm celebrates the evolution of one of the most dynamic cities in the world, seamlessly juxtaposing the organic, natural curves of sand dunes and coastline with the marvel of the geometric lines of the city’s skyscrapers. It begins with the hotel’s iconic “W” sign patterned to resemble an evaporated desert river bed and the WHEELS (valet) area reminiscent of a falage, a cavernous riverbed covered by palm fronds. The W Lounge (lobby) is a stage to see and be seen and celebrates the city’s well-known love of opulence with several geometric fixtures that mimic the raw, natural form of gold. An artistic interpretation of a traditional fire pit sits in the center of the W Lounge, signifying the bonfires that Bedouin tribes would gather around during their desert travels years ago. Connecting the W Lounge to the nearby VIP Lounge is a 13.5-meter sofa in muted earth tones, representing a desert mountain range – the skyscrapers of the past. All 350 guest rooms and suites offer uninterrupted views and dreamy amenities. Curved walls are intricately tiled to glisten like the lights and colors of the sea at various times of the day, bringing the shoreline into each room. Modern graffiti adorns the walls of every room, featuring lyrics in Arabic from an iconic song by Lebanese singer, Fairouz. After checking in, guests can check out the incredible amenities of W Dubai – The Palm, including the hotel’s multiple pools that sit in a wave-like pattern in the center of the Escape to form the W brand’s iconic WET® Deck experience directly facing a fabulous beach with views of the Dubai skyline. Here, guests can swim, soak up the sun and enjoy signature beverages while listening to live DJ performances. The W brand’s signature AWAY® Spa invites guests to ‘Stroll in and Strut out’ offering ten treatment rooms, a steam room, sauna, experiential showers, a hammam and a couples’ suite. Guests are treated to a design inspired by the underwater perspective of a pearl diver, where iridescent shells reflect the sunlight that peeks through the ocean above. Relaxing, social and surreal, the space also features a Beauty Bar for touch-ups and ‘Quick Fix’ treatments. Lastly, guests can sweat it out at FIT (gym) which boasts state-of-the-art equipment overlooking the WET Deck, beach and skyline views, featuring abstract art inspired by the graceful forms of both jellyfish and the parachutes of adventure-seeking skydivers. Pro snowboarder turned adrenaline-fueled culinary master Chef Akira Back brings his modern taste of Japanese cuisine prepared with a Korean essence to the Middle East for the first time at Akira Back. SoBe (short for South Beach) is an adults-only playground inspired by the eclectic and vibrant spirit of Miami. This is the only rooftop bar in Dubai where guests can watch the sun sink into the Arabian Sea with 360-degree views to watch as the Dubai skyline lights up each night. Serving up eclectic live DJ performances, imaginative cocktails, and even tattoo artists, there will be nothing else like it in the city. LIV offers guests greener, lighter, fresher and brighter options for breakfast, lunch and dinner and was designed using only upcycled materials, meaning no new materials were created to build the venue. The restaurant is sprinkled with artwork inspired by the patterns left on beaches by sand bubbler crabs, the official mascot of W Dubai – The Palm. Featuring over 2,000 square meters of event space, W Dubai sets the stage for any elaborate occasion. The sprawling 1,215-square-meter Great Room boasts an extraordinary oval shape, sensually designed with rotating walls letting in (or blocking out) the dazzling Arabian sun. Custom lighting features allow W Dubai to personalize each event, lighting up the scene with a myriad of colors. The Green Room serves as a holding area for events and weddings and features light pendants reminiscent of wedding bands and carpeting adorned in henna-like patterns.